Keywords: ODE Solver, Taylor Solver, Taylor Method, Taylor Series, Power Series Method, Differential Transform Method, Numeric Integration, High Accuracy, Ultimate Accuracy, Finite Step, Dynamic Graphics, 3D Stereo, 3D Cursor, Trajectories, Interactive environment, Windows, Linux. · The Taylor method computes the increments of the solution with principally unlimited order of approximation so that the integration step must not approach zero whichever high accuracy is specified. That is possible because the method performs the automatic differentiation – exact computing of the derivatives up to any desired order n, allowing to obtain the Taylor series of any length for the solution components. · The Taylor method does not use any finite difference formulas such as f'(t) ≈ ( f(t+h) – f(t) ) / h prone to (catastrophic) subtraction error with float point numbers of fixed length. · The Taylor Center utilizes the 80 bit float point type extended with 64 bit mantissa generic for the processor X87 FPU (while other numeric programs usually use 64 bit type double with 52 bit mantissa). To download the Demo for Windows click here, then download and unzip the file ("Save", don't "Open" it in your browser). Unzip and keep it in an empty folder, TCenter.exe being the only executable to run. Preserve these files and sub-folders structure (in order that the program work properly). See a short guide navigating you through the DEMO. You can also download the full User Manual (in MS Word doc format), or the articles (in pdf) published in the Proceedings CSC 2005 , DMS 2007 , and in CODEE Journal, September 2012. From the algorithmic point of view, this software parses the right hand sides of the ODEs and auxiliary equations, and compiles them into a sequence of pseudo instructions of Automatic Differentiation. Then the programmatic emulator of those instructions runs them evaluating the derivatives and integrating the Initial Value Problem. To make inquires, please contact Alexander Gofen at galex@ski.org . Perform integration either "blindly" (observing only the numerical changes), or graphically visualized. 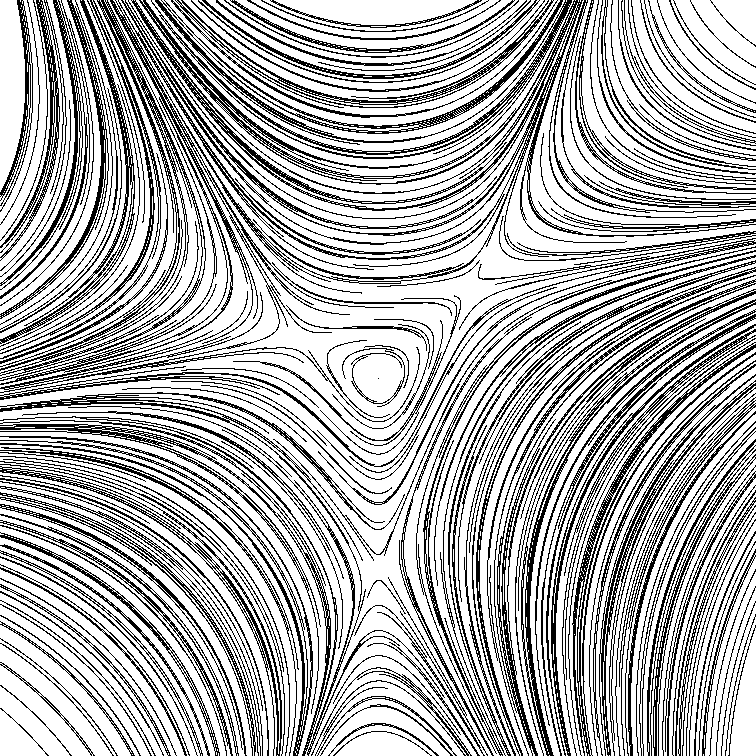 Graph the enhanced field of directions (a Phase portrait), actually the field of curvy segments, whose length is proportional to the radius of convergence. Explore a collection of meaningful examples supplied with the package such as the problem of Three and Four Bodies. Symbolic constants and expressions allow parameterization of the equations and initial values, along with trying different initial configurations of special interest. Automatically generate ODEs for the classical Newtonian n-body problem for n up to 99, and then integrate and explore the motion. In the case of n=99 there are 595 ODEs, 19404 auxiliary equations, compiled into over 132000 variables and over 130000 AD processor's instructions: a "heavy duty" integration! Integrate a few special instances of singular ODEs having regular solutions at the points of the so called "regular singularities". In particular, the Demo includes fascinating examples of the so called choreography for the 3 body problem: 345 of them (courtesy of Dr. Carles Simò), plus 204 cases of periodic orbits of unusual shapes (courtesy of Ana Hudomal). Click here to learn more about the Choreographies of N-body problem and how to "feed" their ODEs and initial values into the Taylor Center, plot the curves and play the motion in the real-time mode: all in the same place. 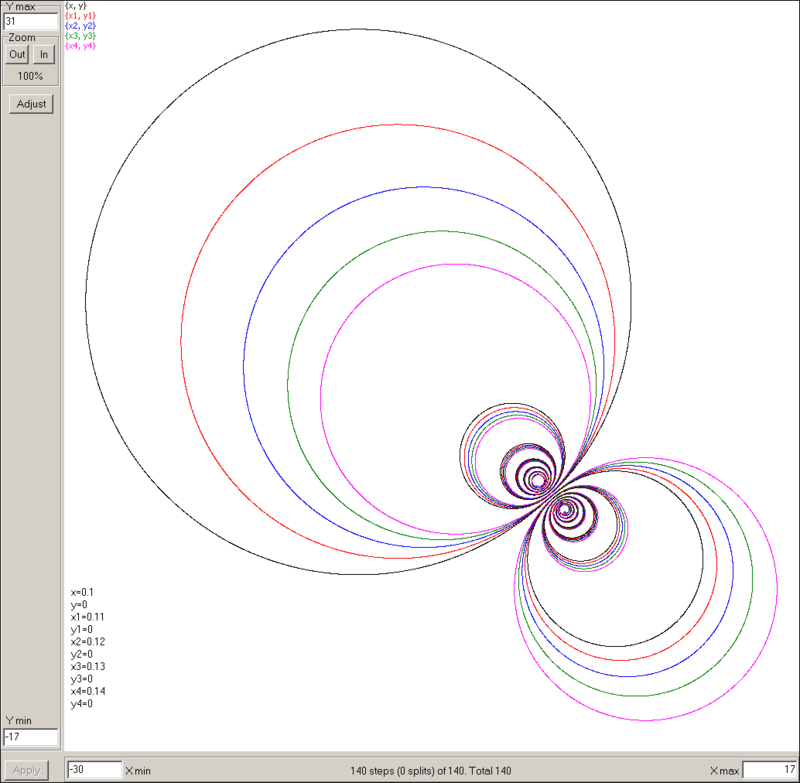 Similarly, click here for playing with the periodic orbits for the 3 body problem from the list of Ana Hudomal. 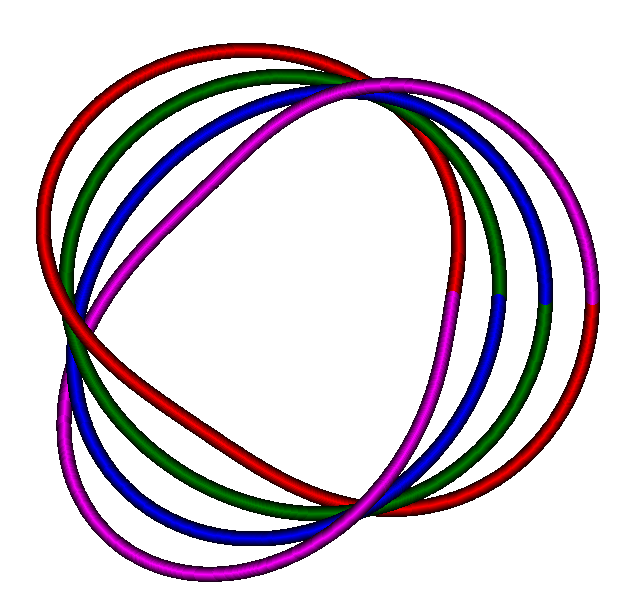 These orbits are closed curves (as intuitively expected from periodic orbits). Here however you may see the newly discovered periodic orbits which are finite curved segments, whose extremes are resting points in the 3-body problem, so that the bodies periodically fulfill a free fall along these segmented orbits (the data was kindly provided by Xiaoming LI and Shijun LIAO). Another recent fascinating example of the four body non-planar trajectories inscribed in a cube discovered by Cris Moore & Michael Nauenberg (also here) is incorporated too. Here is the list of brief explanations for all several hundreds samples pre-loaded with the program. As of now (and in foreseeable future), the Taylor Center will remain a 32-bit application run on the x87 FPU. This processor was designed to address only 32 bit address space, i.e. no more than 4 Gb memory, or 400 millions of variables and their expansions (as 10 byte float point numbers). In order to randomly address a memory space larger than 4 Gb, Intel (and other companies) enhanced the x87 FPU processor by adding a set of instruction SSE capable to randomly access a 64 bit address space. However in doing so, Intel designed the SSE instructions to operate only on the 8 byte data types abandoning the 10 byte type extended. Though it is logically possible to expand the addressing ability of the x87 FPU by combining its 32-bit instructions with the SSE instructions to randomly address the 64 bit memory space, such a trick prohibitively slows the overall operation speed of x87 FPU on the 10 byte type. For the program like the Taylor Center it's crucial to operated with the highest precision available in a processor. Therefore, with such a design blunder by Intel, it makes sense to maintain the Taylor Center only as a 32 bit application operating at the x87 FPU with the 10 byte type at the highest speed. The memory consumption depends on the number of variables VarNum (a function of the number of ODEs and their complexity) and on the specified Order of approximation. 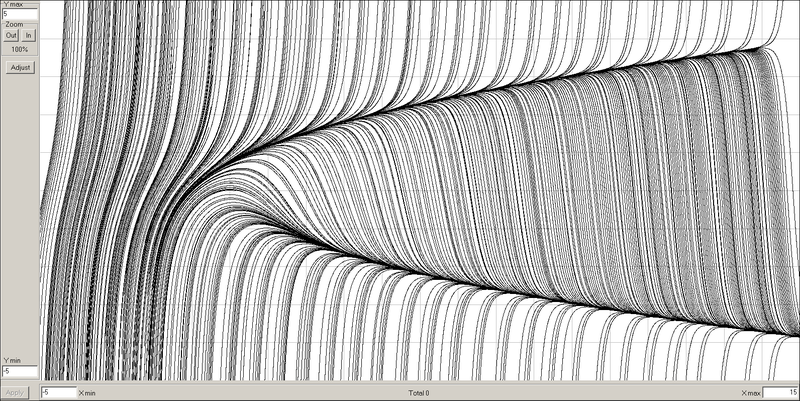 If the expansions are not stored, the program takes 2*VarNum*Order*10 bytes of memory. If the expansions in P points are stored, it additionally requires P*VarNum*Order*10 bytes. Here is a benchmark for the 10 body planar problem comprised of 2*(10+10)+1=41 ODEs and 10*9/2*(2+1)=135 auxiliary equations, which are parsed into 811 AD instructions. For this problem 10000 steps of integration took 32 s (or 3.2 ms per step) on 2.4 GHz Pentium with polynomial expressions spelled out, and it took 29 s (or 2.9 ms per step) with polynomial expressions encoded. For a benchmark for the 99 body spatial problem comprised of 3*(99+99)+1=595 ODEs and 99*98/2*(3+1)=19404 auxiliary equations, 100 steps took 65 s with polynomial expressions spelled out, and took 42.5 s with polynomial expressions encoded. Generally for each system of ODEs there exists such a small value of the accuracy requirement, that at this high accuracy the Taylor methods beats any fixed order method due to the unlimited order of approximation in the Taylor method. 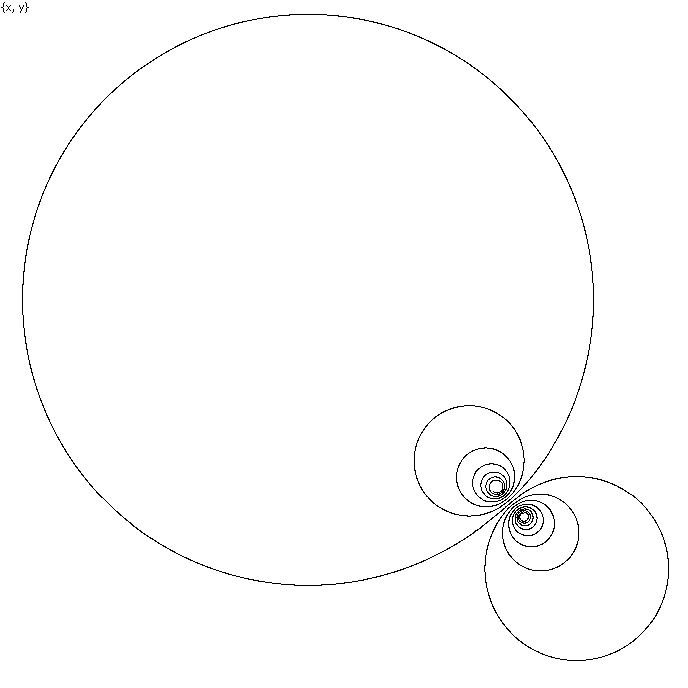 To integrate IVPs in complex variables along an arbitrary path in a complex plane. It will implement the Merge procedure and a library of ODEs – definitions of a large variety of commonly used elementary functions. (Presently, the functions which are not in the allowed list, may be used also – providing that the user declares the ODEs defining them and properly links them with the source ODEs (more about that in Help for Merge). Also, it will include a larger variety of the "calculator" functions for specifying even more complex relationships between constants, parameters and the initial values. And here are the trajectories of a slightly disturbed (Lagrange) case of the Three Body Problem (Demo/Three bodies/Disturbed/2D). However there is a dramatic difference between viewing a still image like in this page vs. dynamically evolving real time motion displayed in the running Taylor Center. In the Demo you will be fascinated to watch all possible pairs of the three bodies coupling randomly in turn with acceleration or deceleration. It is quite different thing to watch the real time motion along this spiral observing that every lap of the spiral takes exactly the same time to run (with a huge acceleration in big laps), as it follows from the complex analysis. The unique feature of this software is that 3D viewing and real time animation is implemented also in stereo mode. To view stereo images, you need anaglyphic Red/Blue glasses (Left - Red, Right - Blue). Such glasses may be ordered here: look for a Red/Blue type (not Red/Cyan). Normally, in order to populate and reach the maximal accuracy in 64 bit mantissa, 19 or 20 significant decimal digits suffice. The routine converting real decimal numbers into this float binary format may take also extra decimal digits, yet the binary result will be rounded to 64 significant binary digits anyway. In this example the two decimal numbers are represented with 22 decimal digits, however the difference between their binary form is exactly one last bit of the mantissa (the goal set in this experiment). 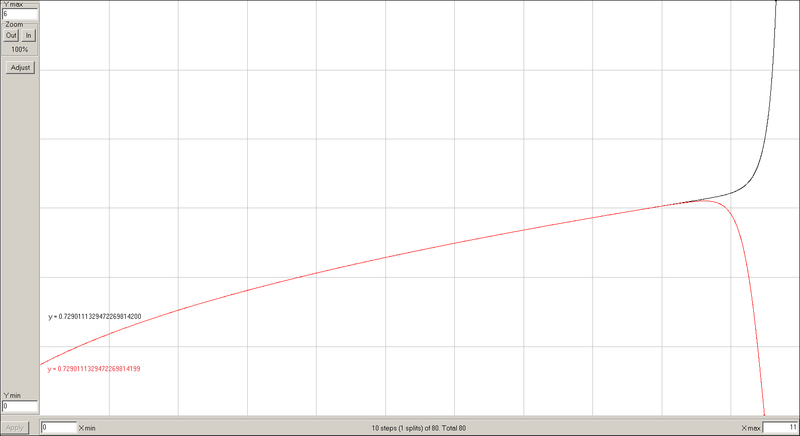 This smallest difference in the initial values however was enough to finally direct the black curve upward yet the red curve downward, demonstrating the ultimate accuracy of integration for this 64-bit mantissa real type. The relative error tolerance in this case was set to 10-25 < 10-19 meaning that at every of 80 finite steps, all 64 binary digits of the result were true, so that the highest accuracy at every step (in a format with 64 bit mantissa) was achieved.